The Die Casting Part on the left was made using the Die Casting Tool on the right. The Die Casting Tooling pictured above is a unit die. Description of Unit Die Casting Tool. This type of tool is faster to set up and many times costs less to produce. This tool is sometimes used for high quantities, but not often. 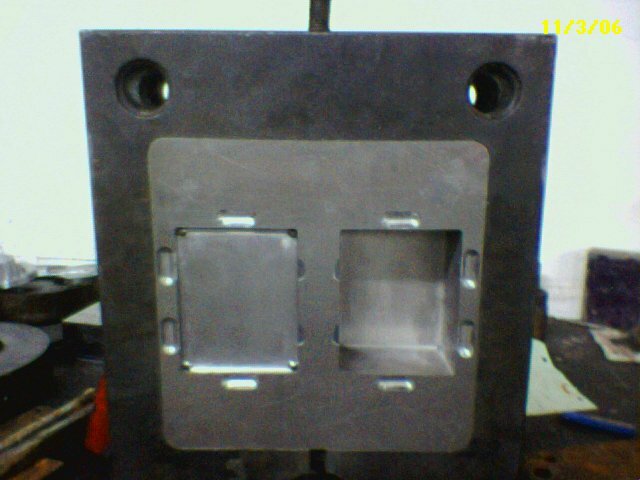 High volume production die casting tooling is usually a class "A" complete die. Learn more by looking at our die cast part sizes & die cast production capabilities. The types of parts we produce with our die casting tools: Pictures of Die Casting Parts. After a part is produced with the diecasting tooling in the diecasting machine, a die casting trim tool called a trim die is used to sheer the excess aluminum around the parts. Die casting trim dies can save as much as 15% in the part price by speeding up the production process. Die casting trim dies cut or shear excess aluminum from die cast parts. The trim die sits or is mounted into a trim press that hydraulically forces the two halves of the trim die together with several tons of pressure. A new Class "A" Die Casting Tool looks like the die casting tool pictured here to the left. For a description of a Class "A" Tooling for Die Casting. 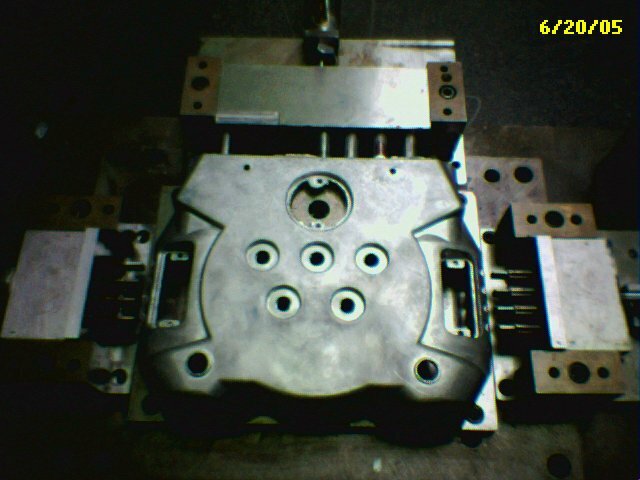 Pictured to the right are a set of customer owned diecast inserts mounted in a diecast mold base owned by the die casting company. 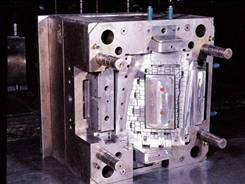 The Die Casting Tooling Inserts are mounted in a diecasting mold base, or called a die casting die. These are steel inserts that come in contact wih the molten aluminum. 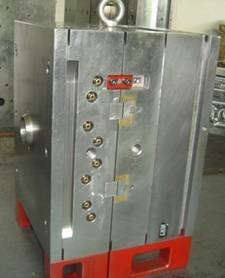 "Two cavities, Box and Cover Tooling Inserts mounted in mold base"